In 2009 I traded a DRZ and a bunch of cash for a 2008 Husqvarna TE610. I kept the Husky for four years and put nearly 20,000 miles on it. During that time Husqvarna replaced the TE610 with the TE630, discontinued the TE630, released the TR650, got bought by the CEO of KTM, and discontinued the TR650. Today Husqvarna dual sport adventure bikes are a distant memory but in 2009 the TE610 was the new Hotness on the dual sport scene. Iin case you are considering on buying a TE610 or 630 on the used market here is the on-going review I wrote during my Husky ownership. I hope you find it informative. I’m a fan of the KLR. Old generation, new generation, doesn’t matter, I like ’em. I’ve had 2 of them so far. One old generation and one next generation model. Both good bikes. 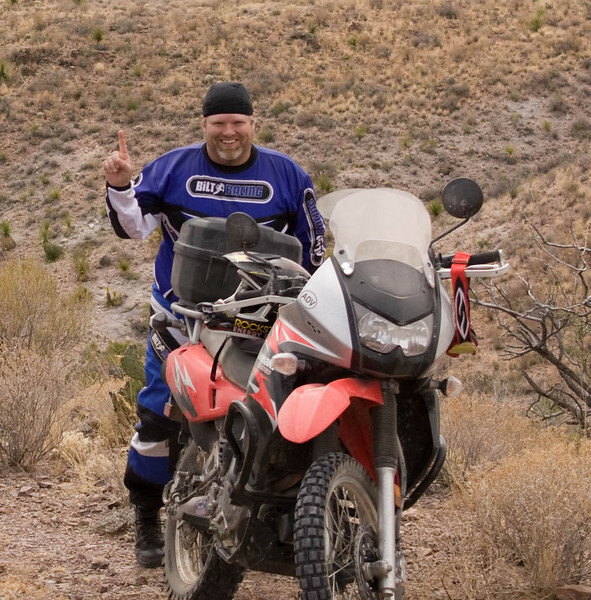 As my friend indicates in the above photo, the KLR is #1 for lots of riders. Its not that I think the KLR is the best dirt bike or that you can embarrass sport bike riders in the twisties on one or that it is a bike that can go anywhere and do anything. Instead, IMHO, the KLR has long been the best bike available for what I call adventure riding. For me, adventure riding consists of everything between class 3 non-paved roads to freeway riding. I want a bike that I can ride 500 miles of freeway one day and then spend the next day riding class 2 and 3 non-paved roads. A bike that I can go for a day ride in the hill country today and then load up with luggage tomorrow and head out on a 10 day trip to Copper Canyon and back. If your riding envelope consists of class 1, 2, and 3 dirt roads, barely paved back roads, county roads, highways, and freeways, then the KLR is the bike to beat. I don’t include actual off-road riding in the equation. No single track, no motocross tracks, and no hare scramble/cross country courses. Sure, the KLR can do some of that stuff, but it’s not a requirement that the bike needs to be capable of doing. 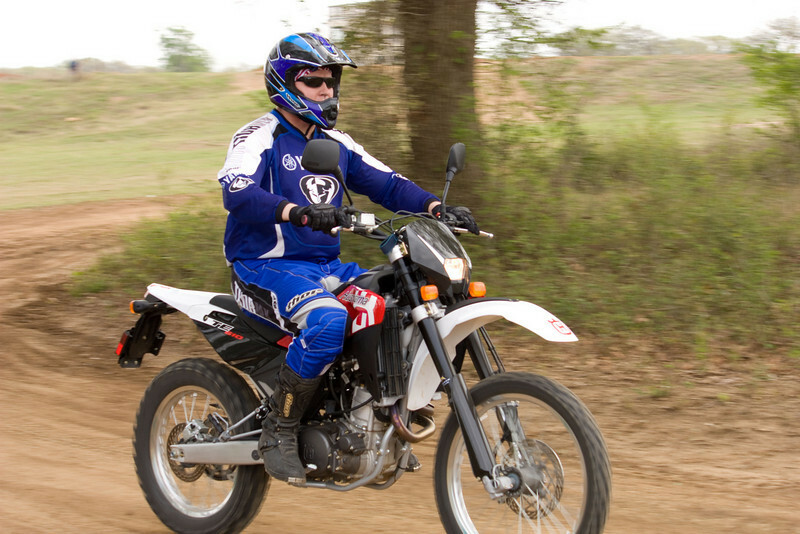 The bike just needs to be able to handle all manner of paved roads and non-paved roads up to class 3. Within these parameters I think the KLR has long been the best tool in the tool box. 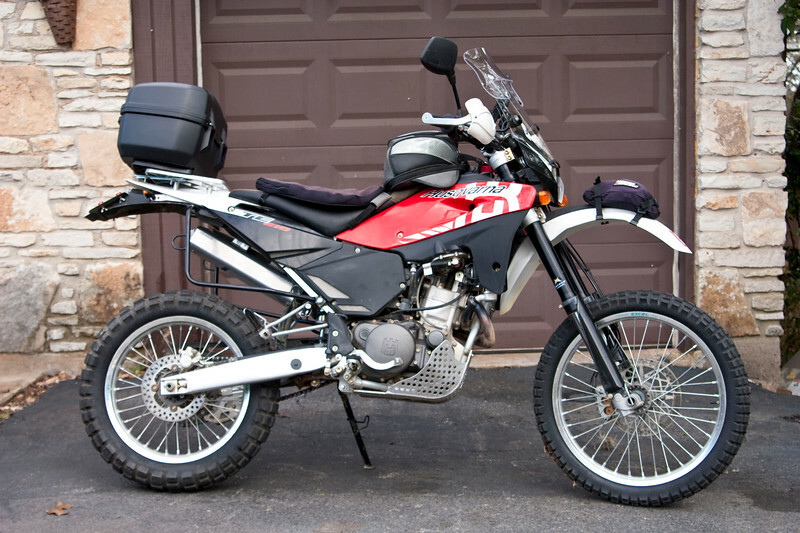 I don’t mean to disrespect the DR650 or to make the owners of any particular model of bike upset, I just think the KLR has long been the best bike available for adventure riding. All the other adventure bikes tend to be better on one end of the spectrum or the other – either they are better on the non-paved roads or they are better on the highways. But, by being better in one area they give up capabilities on the opposite end of the spectrum. Those bikes, like the DRZ400, that are more capable in the dirt are less capable on the highway. Those bikes better on the highway, like my Wee Strom, give up a lot to the KLR in the dirt. I submit that this is one of the main reasons the KLR has been so popular for so many years with the adventure riding crowd. While it has known flaws and faults there hasn’t been a better overall choice. I may have found the bike that beats the KLR. A bike overall better at adventure riding. A new King of the Hill, if you will. I’m talking about the Husqvarna TE610. I recently made a trade for a 2008 Husqvarna TE610. I’ve only had it for a few weeks and haven’t ridden it enough yet to definitively say that, for me, the Husky is a better overall choice than KLR. I can say that my experiences with the TE610 so far have me seriously thinking it is a better adventure bike than either generation of KLR. The final thing I need to decide the issue is to take the Husky on a long, multi-day trip. Once that’s done I will be ready to settle the issue in my mind. Why do I think so highly of the Husky. What makes me think it is likely a better overall choice than the KLR? First, right out of the box the Husky is better in the dirt than the KLR. There is no question of that. It weighs about 100 lbs less than the KLR (319 lbs vs 418 lbs), has 142% more horsepower (50hp vs 35 hp), better gearing, better suspension, and better brakes. All these things make the Husky excel in the dirt. 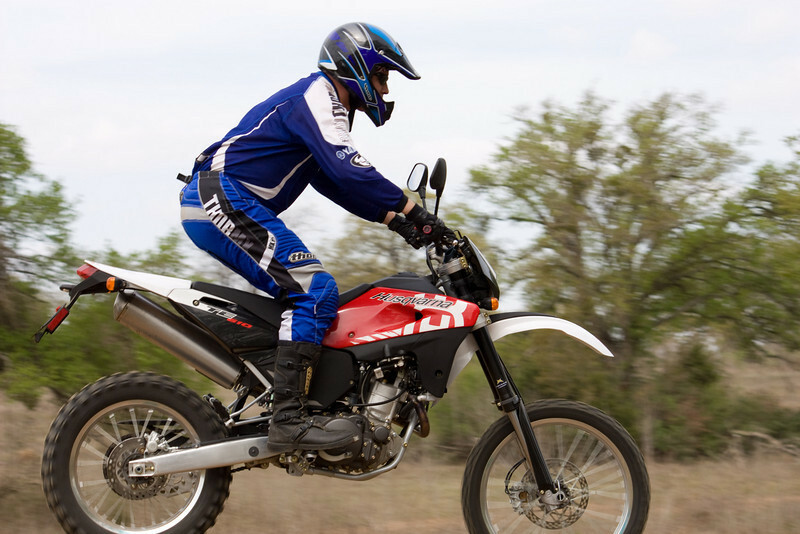 The Husky performs a lot like the DRZ400 in the dirt. Does that mean the Husky performs less well on the highway than the KLR? In stock form, Yes and No. The Husky has a wonderful, wide-ratio 6 speed transmission that seems to be geared perfectly for adventure riding. It’s got a granny gear on one end and an overdrive gear on the other. That 6th gear means the Husky can cruise at freeway speeds without issue. The 50 horsepower engines provides plenty of passing power, even at highway speeds. The KLR lacks on both of these, meaning the Husky has the advantage in this area. 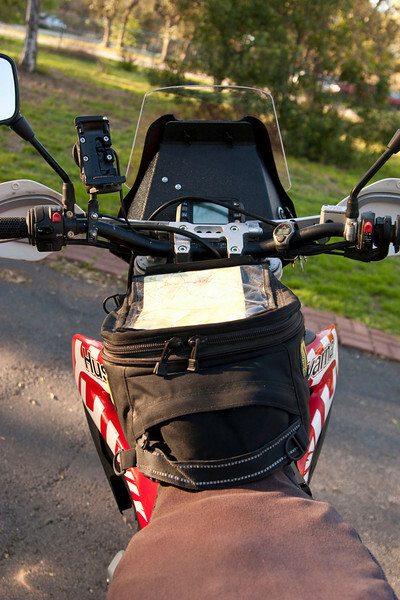 The Husky also has a sub-frame so you can load it up with all the same gear you would carry on a KLR. In this category, the two are tied. Where the KLR wins on the highway is comfort and range. 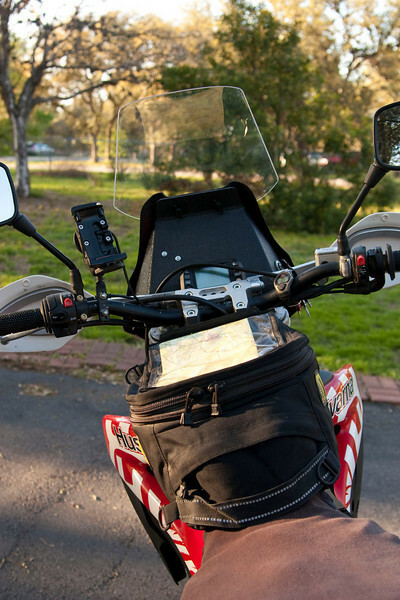 The wider seat and small windscreen of the KLR are measurably more suited for highway travel than the Husky’s 2×4 seat and headlight cowling. Plus, the KLR’s 5.5 gallon gas tank gives it more range than the Husky’s 3.3 gallon tank (250 miles to the tank vs 165 miles to the tank). 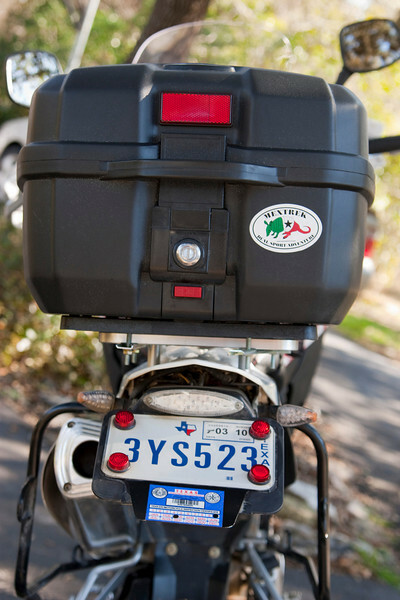 Can the comfort advantage of the KLR be nullified by the Husky aftermarket? Yes on the seat, maybe on the windscreen, no on the gas tank. 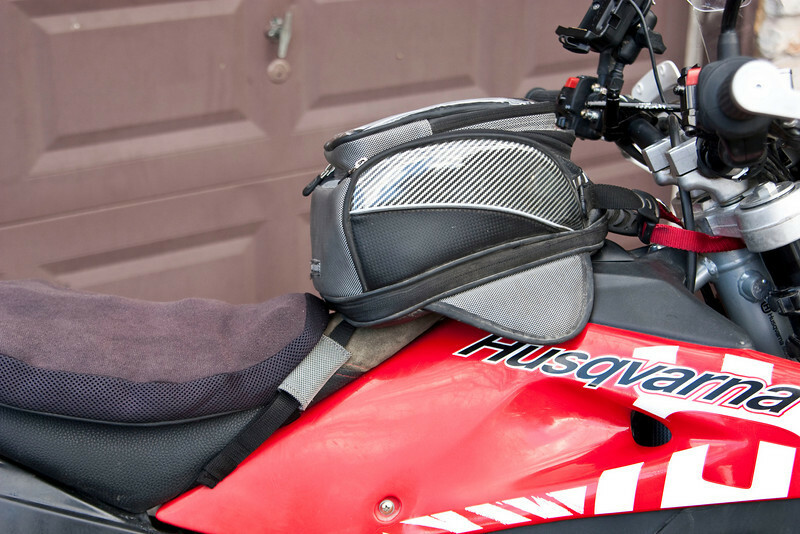 Renazco Seats will rework the Husky seat, converting the stock seat from a torture device into a reasonably comfortable saddle. If that’s not good enough, then an Airhawk seat cushion finishes the job. 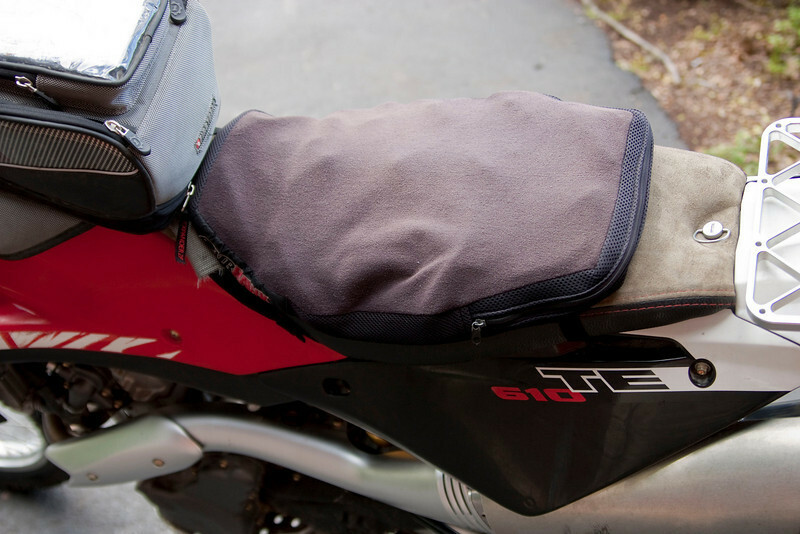 This combination makes the seat all-day comfortable for me and easily as comfortable as the stock KLR seat + Airhawk. 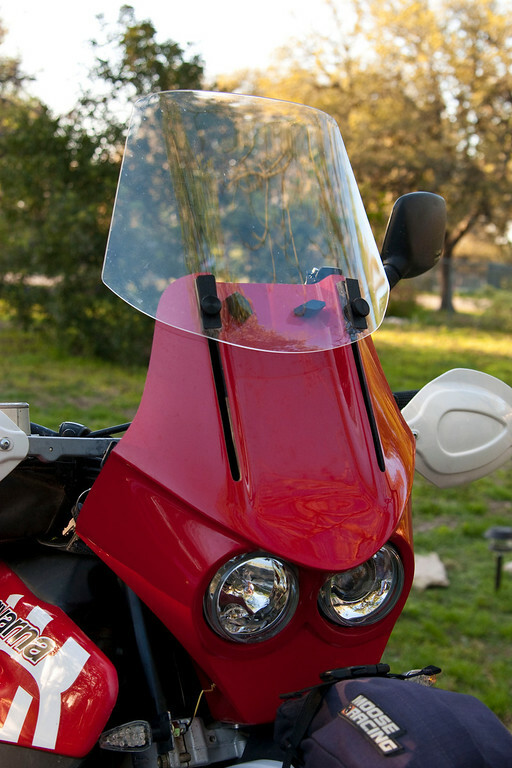 The KLR windscreen on the next generation KLR is pretty darn good. I put a Laminar Lip on it and that made the wind protection good enough that I wouldn’t hesitate to ride the KLR around the world. 08 KLR tall windscreen + Laminar Lip made the wind protection good enough for me that I would ride the KLR anywhere, even around the world. I haven’t been able to achieve the same level of wind protection and comfort on the Husky. In stock form, the Husky only has a cowling around the headlight. This means that at highway speeds your upper body is one big sail. If you don’t mind that, then nothing else need be done. If, like me, you want some wind protection, then you have to go to the aftermarket. The first thing I tried was a laminar lip attached to the headlight cowling. It worked okay. It got the wind blast off the lower part of my torso, moving it up to my shoulders, upper chest, and head. Not bad but I still had to fight the wind, keeping my abs slightly tensed – I couldn’t sit in a relaxed position at highway speeds which meant a greater level of fatigue after a few hundred miles of paved riding. Laminar Lip attached to stock cowling. An improvement over stock, but still lacking. Next I installed a Maier Cyclone universal windscreen. It was a step up from the laminar lip. It moved the wind blast completely up and off my body so that only my head was in the wind stream. Now I could sit relaxed. But, the downside was a LOT of wind noise. I wear earplugs but even with them in, the roar was much louder than I prefer. Finally, I added the Laminar Lip to the Maier Cyclone windscreen. This has been the best combination so far. The wind blast is off my torso and the wind roar has been reduced. It’s still noticeably louder than I prefer but its not as bad as with the Cyclone windscreen by itself. I’m still going to experiment with it some more, but as of now the KLR still wins in this category. Maier Cyclone windscreen + Laminar Lip – an okay combination, but still not good enough for my preference. I don’t know the full history of the model but apparently Husky has been making the TE610 for some time now. In 2006 they redesigned the bike in its current dual sport configuration. I don’t know anything about the earlier models, so my discussion here is limited to only the 2006 and later model of the TE610. The 2006 & 2007 TE610 models were carbureted. 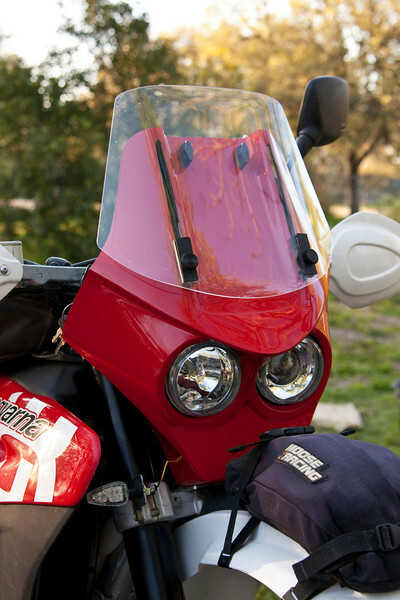 A larger capacity (5 gallon) aftermarket gas tank is available for the ’06 and ’07 models, nullifying the KLR’s range advantage. In 2008 Husqvarna upgraded the TE610 to fuel injection. No aftermarket tank is currently available for the fuel injected models, meaning the KLR has a range advantage over these bikes. If you need more range, you’ll have to strap/carry an extra gas tank of some type on the bike. The Husky holds just 3.3 gallons of fuel. 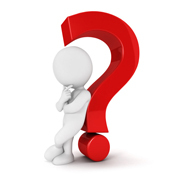 A larger aftermarket tank is available for the carbureted models but not the newer fuel injected ones. For me, there is no question that compared to the KLR the TE610 is both a better dirt bike and better for the types of day rides that most adventure riders do. Its lighter weight, better suspension, higher power, 6 speed transmission, and better brakes make it significantly better in the dirt than the KLR. 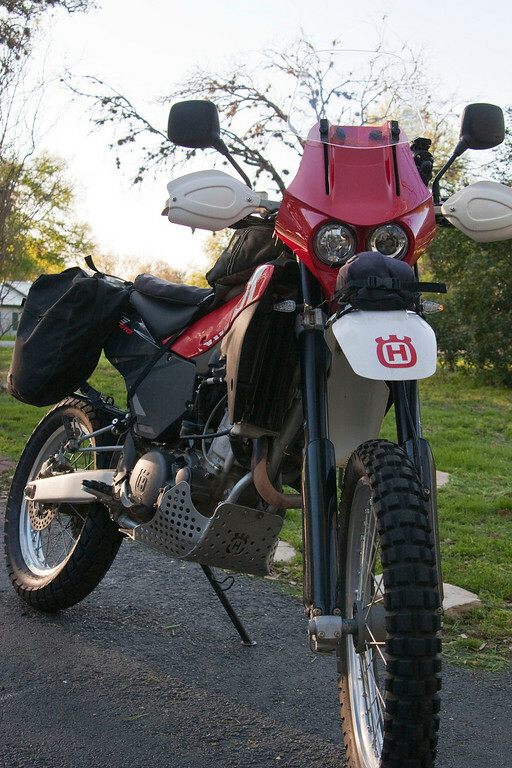 With some aftermarket mods the Husky beats the KLR as an adventure bike for day trips. The only area where the KLR holds an advantage over the Husky is in wind protection and fuel range (vs. the fuel injected TE models). If I can ever get the wind protection to equal that of the KLR then, for me, there will be no question that the TE610 is an overall better adventure bike than the KLR. In the meantime, I’ll end by saying the TE610 is likely the new KLR – the best adventure bike currently available – and that personal preference is the deciding factor. If you can live with the wind and less range, then it’s “case closed”. As an FYI for those that like this sort of stuff. Here’s the data on the KLR as published in Motorcycle Consumer News (MCN). 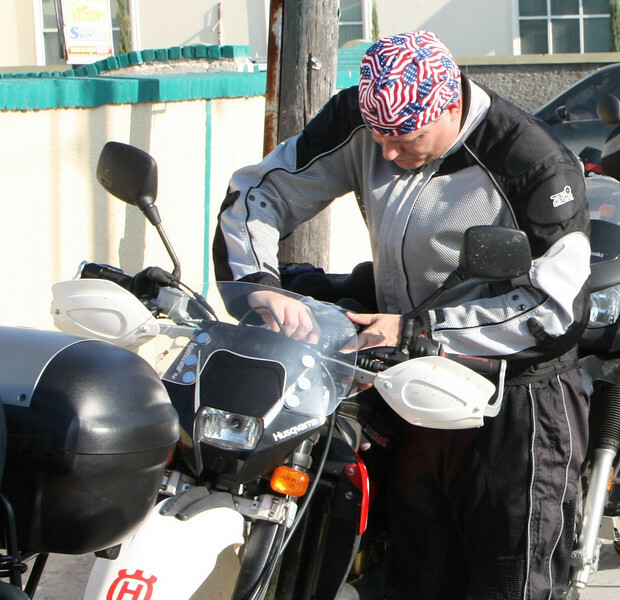 Wet weight is the weight of the motorcycle, full of gas, ready to ride – i.e. what the bike actually weighs in a fully rideable condition. Unfortunately, MCN did not the TE610, so the following data is pulled from other sources. Wet weight is from Rick Ramsey who weighed his 2008 TE610, full of gas and ready to ride. As a point of comparison, here’s the data on Suzuki DRZ-400SM and the Yamaha WR250R from MCN. I decided the aftermarket windscreen was not doing the job. It wasn’t made for the stock 1 1/8 bars the Husky comes with, it was too noisy, and it wasn’t adjustable enough. So, I bought a Lynx fairing from Ian at Britannia Composites. I chose the Lynx for several reasons. First, it is a laminar design – the screen is offset from the fairing allowing some wind flow between the fairing and the screen which should reduce or eliminate buffeting. 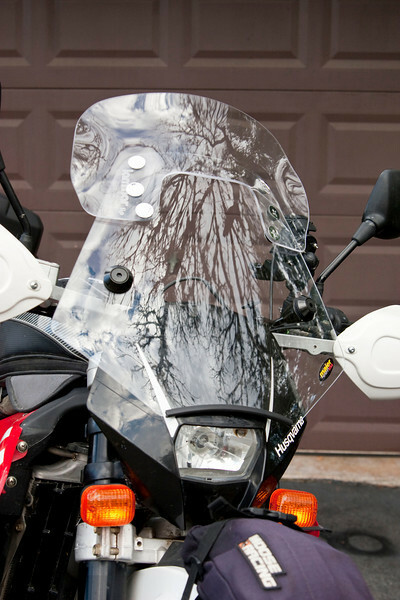 Second, the wind screen is adjustable allowing it to be raised for more wind protection while riding on highway riding and lowered when riding in the dirt. Third, the Lynx headlights are significantly better than the stock candles that Husky calls headlights. I think my penlight puts out more light than the stock Husky headlights. I’m not good at drilling, cutting, fitting so the installation procedure was HORRIBLY frustrating for me. If you are good at fitting, drilling, cutting & modifying then it would probably be a breeze for you. Anyway, after two weeks of working on it a few minutes or hours most evenings I finally got it installed and the bike back together. Here are the obligatory photos. I’ve only ridden it twice for a total of about 200 miles of pavement. How does it work? My initial impression is that it is as good or better than a stock KLR fairing. With the windscreen in the fully raised position the windstream is hitting my helmet right about eyeball level with no wind blast at all on my torso. I was able to sit completely relaxed while riding. Very nice. There is no buffetting either. It’s was [I]very [/I]windy both days so while riding I experienced the wind coming from all directions (front, rear, & cross) and the Lynx performed as expected. In short, I still need to do some multi-hundred mile days to fully test the Lynx but I’m encouraged by my experience with the Lynx so far. Is the TE610 the new KLR – the best adventure bike currently available? Earlier I said I thought it was but needed to address a few issues and then give it a multi-day test before I could definitively so yes or no. I have now made all the modifications I wanted to in order to see if I could fix the issues and I have also given it a 9 day, 2000 mile test. Based on this I have to say today that, candidly, no the TE is not the new KLR. But not for the reasons you may think. The TE610 had two issues I felt needed to be addressed in order to claim the King adventure bike crown – fuel range and wind protection. I felt that the TE needed more range (it has about a 150 mile range on one tank of gas) and wind protection to be truly competitive against the KLR. Safari Tanks, in Australia, came out with a 6.6 gallon tank for the TE610 & 630, solving the fuel issue. The wind issue is solved, in my opinion, by the Lynx fairing. I extensively tested it during a 9 day, 2000 mile extended MexTrek and found it to work superbly. It worked so well that I found I could ride all day without excess fatigue due to wind blast. Sadly, the only issue is the guy who makes the Lynx fairing announced he was going to stop making them. So, why isn’t the TE610 the new KLR? In my opinion it’s because of a too-weak subframe. The subframe is made of aluminum and appears to be not particularly strong – there have been a number of reports of broken subframes on the TE. While I’ve had no issues with mine the reports of those who have broken their subframes has caused me enough concern that I am uncomfortable loading the back of the TE with gear and then riding it off-pavement. I don’t mind riding it on-road loaded down, but am concerned it would break during dirt riding even moderately loaded. Nor has the aftermarket come up with an easy fix. Various fixes have been tried by various owners with varying results but so far there is no commercially available fix that I know of. Husqvarna has been silent on the issues but they do claim a significantly beef-up sub-frame on the TE630 (the replacement for the TE610). If this is true then perhaps the TE630 is really the new KLR. But until it has been tested the jury is still out. At the end of the day here’s my view on the TE610. It makes an excellent adventure bike with a few aftermarket mods, but it’s not quite ready to take the crown away from the KLR as the best available bike for adventure riding. Fantastic write up in comparison of two great bikes. I have a 2008 610TE and absolutely love it on the freeway and Offroad though it needs a steering stabilizer for cruising over 75 mph, stabilizers always a good idea anyway. Love my 610 and ,dropped the countershaft one tooth to change up the ratios and always amazed how much power it makes stop light to stop light and yet it has the grunt for most any trail. Will probably stay in my collection of Street ,Cruiser and Sport Bikes for a long long time! I am thinking in buying SWM 650 Superdual, What do you think? As long as SWM can support it, I wouldn’t hesitate to buy one. Hi I have a 2009 TE610 and am changing my chain and sprockets. Stupidly I have taken the front sprocket off without paying attention and am not sure which way to put the new one on. Can anyone take a pic of there’s or look and let me know. There’s a raised side (like built in spacer) and a more flush side. Thanks in advance! !